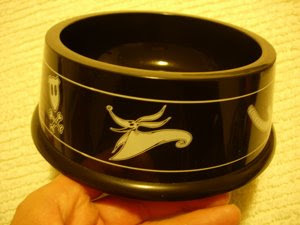 This is a dog bowl, with the name "Zero" on it, for Jack Skellington's dog, Zero, from "Nightmare Before Christmas". This bowl contained a meal once, but not for a dog! The dish served inside was 4 chicken legs stuffed inside some mashed potatoes. I forget what they called this dish, but it was good! The dish was served at The French Market in New Orleans Square at Disneyland, around the Holidays (Disneyland always decorates the Haunted Mansion attraction in a "Nightmare Before Christmas" Theme each year, for the last few years). By the way, if you want this bowl, I'll part with it for $30, plus shipping. Is the Zero bowl still available? I so desperately want this item. 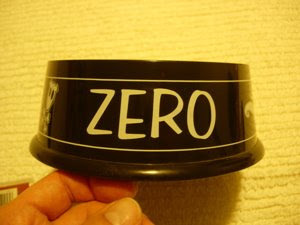 My dogs name is Zero after the character and I have been searching FOREVER to find a dog bowl. Please oh please say you still have it! This item is still available...you must call me on my cell phone, at (323)393-5822 to make purchase arrangements! Did the user Zer0 ever purchase the dog food bowl? If not, I am very interested in this item! Please e-mail me regardless at artoria1920@yahoo.com. Thank you.